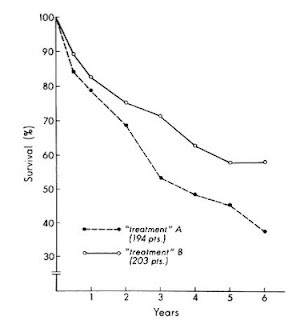 The above figure compares long term survival in a subgroup of a trial that was published in Circulation in 1980. This was a randomized controlled trial of just over 1000 patients with known cardiovascular disease who were treated with medical therapy alone. The patients were randomized to two treatment groups and were followed for 5 years. In the primary analysis, there was no statistically significant difference in survival between the two groups. However, a subgroup analysis that compared only patients with 3-vessel disease and LV dysfunction at baseline (~200 patients in each group) found that the outcomes were significantly better in group B (p=0.025). 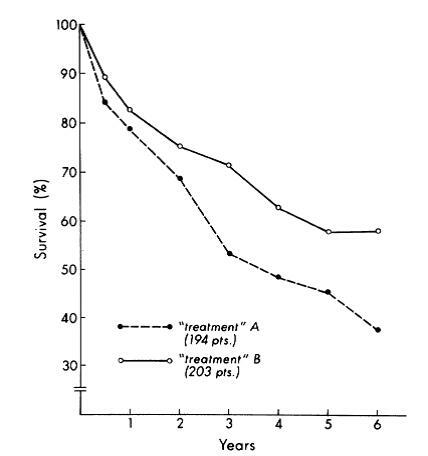 So what was this treatment that was so successful in reducing mortality in group B? There was no treatment. The patients were randomized to the two groups and then simply followed with usual therapy. This study was designed to show the danger of subgroup analyses and why they should be taken with a grain of salt. When the authors looked deeper into the data, it became apparent that the patients in group B were not as sick as those in group A and that the survival difference was non-significant in a multivariable analysis. However, when they further stratified the patients by only including those with no history of congestive heart failure, the difference between the groups became more significant and remained significant in the multivariable analysis (p=0.01). We are often confronted by negative clinical trials in nephrology and other disciplines and there is a natural tendency to try and find something useful when these trials are completed. Like any multiple comparison, if you do enough subgroup analyses, you will eventually find one that is significant. Any good statistician will tell you that this needs to be accounted for in the final analysis but this is not necessarily always done. Think about this trial when you are reading about the wonderful effects of a treatment that was negative for most but efficacious for a small group of patients with very specific attributes. Nathan Hellman, MD, PhD was an insightful young scientist, a compassionate doctor, a good friend, and a charismatic person with the unique ability to bring people together, as evidenced by this blog which he founded as a Renal Fellow in the MGH/BWH Renal Fellowship Program. Since his untimely death, the MGH/BWH program awards the "Nathan Hellman Memorial Award" to a member of the fellowship class who best exemplifies the qualities we so cherished in Nathan. Since this is Nathan's professional community, and the MGH was his professional home, I think it is important to share the following news, in celebration of Nathan's life and achievements. In 2011, the inaugural recipient of the award was Dr. William Pendergraft, MD, PhD, now a research fellow at the MGH. Dr. Pendergraft is currently conducting research in the area of genomics of inflammatory kidney disease such as lupus nephritis. This past week, we had the pleasure of awarding the second "Nathan Hellman Memorial Award" to Dr. Andrew Lundquist, MD, PhD, now a research fellow at the MGH. Dr. Lundquist is currently doing research in the area of genomics/transcriptomics of kidney disease. Let us congratulate Drs. Lundquist and Pendergraft for continuing Nate's legacy of pursuing great science, providing compassionate patient care and bringing our community together! A woman with no past medical history was admitted to the ICU service with acute kidney injury secondary to atypical HUS. She was early in pregnancy and we were consulted in order to start dialysis. The management of a pregnant dialysis patient is no simple matter. About 13-36% of TTP-HUS in women is associated with pregnancy. Pregnancy may be a risk factor for developing TTP-HUS because of hypercoagulability, loss of integral endothelial cell membrane proteins, decreased fibrinolytic activity and ADAMTS13 activity. Among all patients with pregnancy associated TTP-HUS, 8% occurs in the 1st trimester, 16% in the 2nd trimester and 77% in the 3rd trimester or post-partum. 1. Duration and frequency of dialysis: Pregnant patient usually start on daily dialysis with a predialysis BUN goal of <50mg/dl. It has been shown that patients on nocturnal hemodialysis with an average of 48hours/week have better outcomes than women who dialyzed 20 to 26 hours/week. 2. Anemia: Pregnant women usually require higher doses of erythropoietin and iron, with goal of Hg>10g/dl, and transferrin saturation>30%. These targets are based more on patients in the general dialysis population and are not evidence based. Pregnant women are usually anemic although their red cell mass increases. 3. 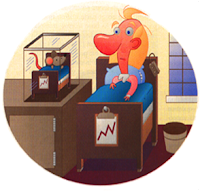 Hypophosphatemia: Our daily phosphorous ingestion is 800 to 1600mg. 2.5g to 3.0g phosphorous is removed during a regular 4 hour dialysis treatment. Phosphorous levels will decrease in patients who receive intensive hemodialysis. Hypophosphatemia can cause tissue hypoxia and intracellular depletion of adenosine triphosphate with impairment of glucose metabolism. In a pregnant patient, our goal is to keep the phosphorous level >3mg/dl with either po repletion or supplemental phosphorous in the dialysate. 4. Calcium: 25 to 30 g of calcium is required for fetal skeletal growth. 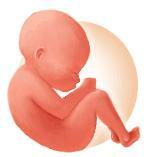 This demand requires transfer of 140mg/kg/day calcium across the placenta. To prevent osteopenia, it is recommended that an additional 1500mg of calcium be ingested daily during pregnancy. In conclusion, adequate dialyses, treatment of anemia, maintenance of nutrition and electrolyte stability are the most important factors for a successful pregnancy in chronic dialysis patients. The outcomes of pregnancy in dialysis patients were reviewed in a previous blog post. Our patient was started on 6 times/week hemodialysis for 4 hours each session. Her phosphorous level was 2-2.5mg/dl after 1 week on hemodialysis. With aggressive oral repletion and a regular diet, her phosphorous level was maintained at 3mg/dl upon discharge. Cardiovascular disease is the main cause of death among ESRD patients. However, this excess cardiovascular mortality in ESRD patients should not be mainly attributed to coronary artery disease or myocardial infarction. The 4D study and other studies have shed some light on this issue and now we recognize that it is actually (non-coronary) sudden cardiac death, and not myocardial infarction, the most common cause of cardiovascular mortality among ESRD patients. The pathological basis for sudden cardiac death in ESRD includes the development of left ventricular hypertrophy, myocardial fibrosis, and microvascular disease, the so called uremic cardiomyopathy. Endogenous cardiotonic steroids (CTS), are molecules similar in structure to cardiac glycosides or digitalis, that are synthesized by the adrenal gland. Elevated levels of CTS have been identified in various pathological conditions such as essential hypertension. CTS bind to the extracellular domain of the α-subunit of Na+-K+-ATPase, which, in addition to its well-known function of maintaining cellular electrochemical balance through pumping sodium and potassium ions, can act as a typical membrane receptor with the production of intracellular 2nd messengers. 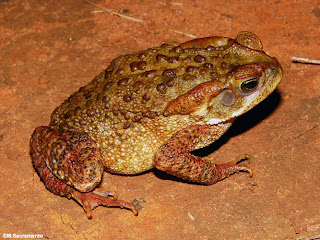 Marinobufagenin (MBG), a bufadienolide CTS (naturally produced by the toad Bufo rubescens) has been implicated in the pathophysiology of uremic cardiomyopathy. MBG is released from the adrenal gland in response to angiotensin II. There is evidence to support the role of MBG in the development of cardiac fibrosis in uremia. What is more, uremic rats who are administered a monoclonal antibody against MBG reverse cardiac fibrosis. Interestingly enough, salt load triggers release of MBG … another reason why ESRD patients should be on a low sodium diet. We were evaluating a kidney transplant recipient three weeks after surgery who presented with a rise in creatinine. 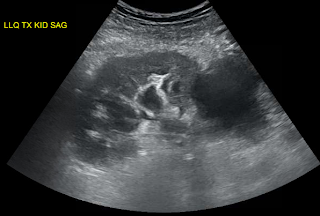 We obtained an ultrasound which showed a large fluid collection and mild hydronephrosis. Prograf level was at goal. Peritransplant fluid collections may be produced by lymphoceles, urinomas, hematomas or abcesses. These collections may compress the ureter leading to hydronephrosis or may compress the renal vein causing a “compartment-like syndrome”. Since his creatinine was risen, we decided to drain the fluid collection. An important point is that mild hydronephrosis is reported in a large portion of kidney transplant ultrasounds and intervention is usually driven by the clinical setting. When in doubt, serial ultrasounds indicating progressive dilatation or the use of nuclear medicine imaging showing normal perfusion and parenchymal uptake but pooling of tracer in the renal pelvis with prolonged pelvic retention helps in confirming the diagnosis. His INR was 2.1 due to coumadin for a history of multiple clotted fistula. The interventional radiologist requested that we give FFP to reduce his INR to below 1.5 before considering the procedure. It was late Friday so we got 4U of FFP in and repeated INR. We were hoping that 4U of FFP would quickly reverse his mildly elevated INR. Interestingly, data supporting that is lacking. FFP can have an INR as high as 1.5 and transfusion of FFP will have little effect on minimally elevated INRs (Gearoid actually pointed that out in rounds). A study of the use of FFP in 121 patients with an INR in the range of 1.1 to 1.85, showed that correction of the INR to normal was achieved in only one patient (0.8 percent) and correction at least halfway to normal in only 15 percent. The median decrease in the PT and INR was 0.2 seconds and 0.07, respectively, and was independent of the number of units of FFP infused (median 2 units; range 1 to 20). Thus, available studies do not support the efficacy of FFP in treating bleeding or as prophylaxis for invasive procedures in patients with a mild coagulopathy (ie, INR below 2.0). After some discussion with IR, they agreed to go ahead with the procedure with an INR 1.9. About 600cc of yellow fluid was drained. Fluid creatinine was checked and was similar to serum level, ruling out an urinoma. This patient’s fluid collection was a lymphocele, which is the most common cause of peritransplant fluid collection due to disruption of renal lymphatics. It usually occurs weeks after surgery and drainage is required only in cases of suspected obstruction. With time, the amount of fluid collection tends to subside. Soon after drainage, his creatinine started to come down confirming the cause of his worsening renal function. Figure: large peri-transplant fluid collection with associated hydronephrosis. Important new findings were recently published in relation to proteinuria and FSGS, which are definitely of interest to our community. In fact, it appears that it is non-specifically found in CKD, and correlates with a declining GFR. A letter to the NEJM editor (here) describes an amazing case of resolution of recurrent FSGS after re-transplantation. A 27 year old patient with primary FSGS receiving a kidney from his healthy 24 year old sister developed proteinuria in the nephrotic range (up to 25 g/day!) within 2 days of transplantation, and had no improvement after plasmapheresis and standard immunosuppressive treatment. A renal biopsy confirmed foot process effacement, the first hallmark of recurrent podocyte damage heralding recurrent FSGS. Incredibly, with all appropriate consents and institutional approval, the transplant team removed the allograft from Patient 1 and re-transplanted it into another patient who had ESRD due to diabetes. Within 3-4 days, the proteinuria resolved and a repeat biopsy showed resolution of foot process effacement and re-establishment of a normal podocyte architecture. Eight months later, Patient 2 is reported to be doing very well, with good allograft function and no proteinuria. This case demonstrates in a remarkable way that recurrent FSGS results from an elusive “factor” rapidly produced by the recipient (with primary FSGS), and that the allograft itself can remain fully functional if removed from the influence of this “factor” and placed in another patient. What may have seemed to be exciting news in 2011, namely the notion that soluble uPAR may be predictive of recurrent FSGS (here), appears to be unfortunately evolving into yet another unsuccessful attempt to identify the ever elusive circulating factor. Recent work published in Kidney International by Maas et al. (here) confirms that suPAR is not able to distinguish between idiopathic FSGS, secondary FSGS or minimal change disease. This is actually not surprising, because a closer look at the clinical data in Wei et al. (here) reveals that the admittedly arbitrary cut-off for separating primary FSGS from all other glomerular disease (3000 pg/ml) did not hold up when tested among their patient cohorts with idiopathic, recurrent versus non-recurrent FSGS (all had suPAR> 3000 pg/ml, thus suPAR could not predict the recurrent from the non-recurrent cases). The second figure in the Maas et al. paper may help explain this conundrum: they show a negative correlation between suPAR and eGFR, meaning that as GFR drops, suPAR levels rise, which essentially means that suPAR is simply a marker of CKD. Future work will no doubt continue to address these issues, but the apparent lack of specificity of suPAR for FSGS casts serious doubt on its proposed role as the circulating factor. So, the search is still on!!! 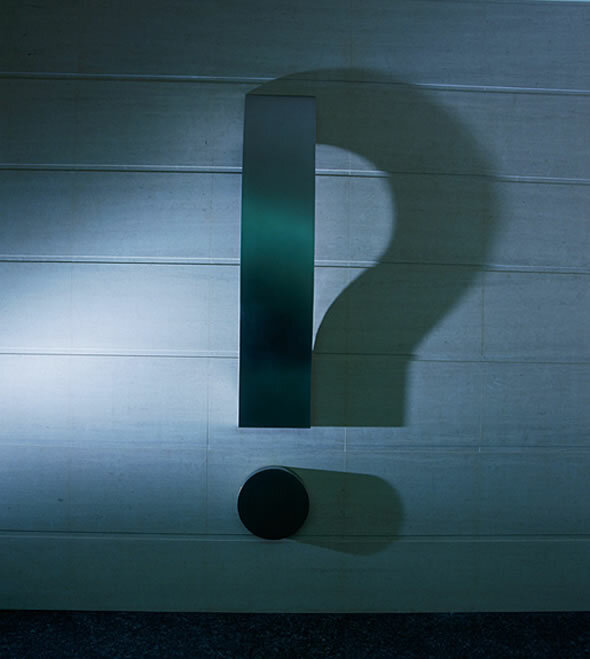 Acute rejection: what do the circulating cells have to say about it? One of the frequent situations that we face in the renal transplant clinic is the patient in otherwise good condition who presents with a slight rise in serum creatinine. Although this is sometimes due to reversible causes, such as high CNI levels or dehydration, acute rejection is of course in the differential. The fact that we still rely on an invasive procedure – the graft biopsy – for formal diagnosis of rejection clearly limits our ability for repetitive monitoring and potentially delays treatment. There is no doubt that a simple, non-invasive assay to monitor the immune status would be of great help in the day-to-day practice. Indeed this is currently a field of intense research in transplantation. We recently provided new insights into this issue. We optimized a simple assay to determine the level of activation of circulating blood mononuclear cells in renal transplant recipients. The method is relatively straightforward: peripheral blood is collected, cells are isolated and incubated overnight; cytokine production by the cultured cells is measured in the cell supernatant. The main objective was to determine if this assay, when used in patients for whom a biopsy was performed for an acute rise in serum creatinine, could identify those that would show histological signs of rejection. We found that the measurement of a single cytokine, IL-6, can predict rejection with a sensitivity of 92% and specificity of 63%. This tool could thus potentially be used to exclude rejection, which would be particularly helpful for low-risk or remote patients. This work is a first step towards the development of a clinically useful tool. Ideally, a non-invasive test would be able to identify acute rejection well before the serum creatinine starts to rise. To achieve this, we now need to collect blood samples and study cell activation serially post transplant. What we need to determine more precisely is when the cells become activated before the usual signs of graft dysfunction occur. This will allow us to identify rejection early and by doing so, to prevent further graft damage. Although this sounds simple, from a research perspective this next step implies an enormous investment of human and lab resources. A young woman presented for altruistic kidney donor evaluation. She had no significant past medical history other than two normal prior pregnancies. Physical examination was unremarkable. A CT angiogram revealed bilateral irregularities of the renal arteries and a 0.9 mm aneurysmal dilatation of right renal artery seen in the figure. Home blood pressures were normal and labs were otherwise unremarkable. Clinical Question: In an asymptomatic, normotensive young adult female with an incidental finding of fibromuscular dysplasia (FMD) with bilateral renal artery involvement is it safe to proceed with altruistic kidney donation? FMD is seen in approx 4% of patients worked up for kidney donation. The natural history is that in the majority of patients the lesions are non-progressive. In one study, primary and assisted primary patency rates were 66% and 87% at 5 years and the restenosis rate was 28% at 5 years. Hypertension improved or resolved within 3 months in 72% of patients and this was maintained in 73% at 5 years. After surgical revascularization long-term blood pressure control was maintained in 93% of patients and improvement or stabilization of renal function was noted in 92%. 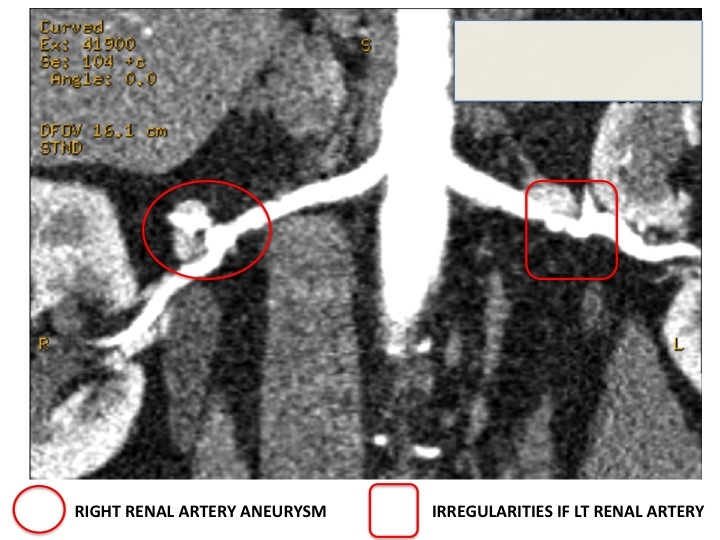 Anecdotal case reports and case series suggest that despite patients being normotensive at the time of kidney donation patients with FMD can develop future radiological worsening of renal artery lesions, hypertension or ischemic renal disease. Kidney donors with FMD thus are potentially more likely to develop hypertension compared to kidney donors without FMD. In the case discussed above, given the young age of the patient, bilateral nature of lesions and the presence of a renal aneurysm we recommended against altruistic kidney donation. We were also concerned that the recipient might develop hypertension post transplant given the irregularities that would be present in the transplanted renal artery. The evidence would suggest that aneurysms that are >1.0 cm, non-calcified or found in pre-menopausal women are at high risk of rupture. Our patient had 2 out of these 3 criteria and therefore underwent coiling of the aneurysm with excellent results.